Very little in life that is worth having comes easy, would you agree? A great marriage; knowledge or mastery of an art or skill; a happy home; good friendships, raising well-rounded children; and more, all require commitment and sustained efforts over a long period of time. Self-discipine and the practice of a healthy lifestyle are no different. The truth is, self-discipline is a muscle that most of us (myself included!) need help to strengthen through practice everyday, no matter what stage or season of life. So today I’m really excited to finally share details about the awesome Healthy Lifestyle Challenge I have lined up for March! I’ve been planning and looking forward to this for weeks!!! I think the plan I’ve come up with is flexible while still being what it’s meant to be, a CHALLENGE! Since it will only be for 4 weeks, we will do some things that may seem a bit drastic, but I promise, WHEN (not if) you stick with it, you will feel results in many areas of your life. So, here we go…ready to join me in this Lifestyle Challenge? If so, please RSVP in a comment below with your email address and, if you like, please include your goal (looking for a new challenge, weight loss, practicing better habit, etc.) for joining this challenge! For example, my goals are to incorporate healthier eating habits into my lifestyle and to lose, ahem, about 6 pounds! Yep, it’s coming off! We will measure our success by a point system. A perfect day will consist of 100 points. You won’t have to get a perfect score of 100 points each day (most of us rarely do), but it’s a goal that can act as an incentive to motivate us to reach as many points as possible. Accountability is the name of the game, meaning you’ll need to track your daily scores and communicate with fellow challengers. The Challenge will last 4 weeks beginning on Monday, March 2, 2015. You will earn your water points by drinking half of your body weight in ounces of water per day. For example, if you weigh 140 pounds, you should drink 70 ounces of water per day. Prepare to use the bathroom often! You will earn your communication points by checking in and touching base with at least one other fellow challenger each day. You can either post a comment on the blog and/or get in contact with other challengers daily—phone calls, e-mails, and text messages count. This is one of the best parts of being in a Challenge—meeting and supporting fellow challengers! As soon as I know the number of participants, we’ll plan on how we can all communicate either by email, in person or vide chat. It’s going to be fun! You will earn your sleep points by sleeping (or being in bed trying to sleep if you have sleep problems) for a minimum of seven hours a night. You will earn your physical activity points by engaging in any form of exercise for at least 20 minutes per day. You can choose to incorporate physical activity in your day through brisk walking, serious gardening, swimming, cardio, weight training, etc. Whatever the activity, you should try to challenge yourself! You may direct your exercise for your own body, but your choice of exercise must be legitimate. No, “I ran around while I chased my toddler or cleaned my house and got sweaty”, is not legitimate. If you would question someone else for considering it as exercise, don’t count it yourself. Eat a balanced (including protein, carbohydrate and fat) breakfast within an hour of waking. An early breakfast helps maintain circadian rhythm, keep your insulin and blood sugar in check, and boost your metabolism. If you wait too long to eat in the morning, you may be more likely to choose high-calorie, low-nutrient foods out of hunger. Eat at least one serving of fruits or vegetables at every meal. Contain your eating to 12 hours a day, or less. See article. Eat meals free of distractions (electronic devices, magazines, books, etc. ), especially if and when eating alone. The first few times you eat alone this way, you might feel uncomfortable. You’ll want to reach for your phone, go to your computer, grab a magazine, or something, anything…. This will be the challenge, don’t give in!!! Take a break to eat mindfully. With a little practice, you’ll realize how nice and enjoyable it is to savor your food and cut distractions at mealtimes. When you accomplish all five eating habits in one day, you will earn a bonus of 10 points (50 points total, instead of 40, for Eating Habits). Otherwise, to earn the full 40 points, you should complete 4 of the 5 habits listed. Update: Partial points cannot be earned per category. For example, you must drink all your water to earn 10 points; you must be in bed at least 7 hours to earn 20 points; etc. Points for Eating Habits is a bit different in that there are five tasks to complete. However, you only need to do four of the five to earn 40 points. If you do all five in one day, you will earn 40 points, plus a bonus of 10 points. If you only complete 3 of the 5, you receive zero points. It’s a Challenge…. It might be challenging, but it’s possible! Throughout the Challenge, I will post weekly challenges that will provide bonus points and incentive to keep going! As white flour and white sugar are basically poor nutrition choices for anyone, there will be a 5-point penalty for the consumption of white flour and sweet treats during the Challenge. You will be allowed one day off (see exemptions below). Watch this one my friends! You will need to become a label reader if you eat a lot of packaged food. Anything with over 5 grams of added sugars is considered a “sweet treat” (naturally occurring sugars, like fruit or milk don’t count as penalties for this Challenge). Nearly all bars (even the “healthy” ones), canned fruit, cereals, even sauces contain added sugar. This really adds up to our over consumption of sugar. This is a strict rule for the Challenge. Avoiding sugar and flour will help steer your food choices naturally toward whole and nutritious food options, as well as teach your body to start burning fats as a stable source of energy rather than carbohydrates. This will likely be one of the hardest parts of the Challenge for many of us at first, but you will soon start to see and feel the benefits QUICKLY! There are no eligibility limitations; making healthy choices is for everyone. All are welcome to join! However, I’d recommend you consult with a physician before starting any exercise or weight-loss program. You may still have questions. If so, that’s great! Send them to me in a comment below! And please, RSVP (in a comment below or email me at petitworldcitizen@gmail.com) with your email address to let me know that you’re joining the growing list of awesome challengers no later than the suggested deadline, Thursday, February 26th, so that I can get an idea of who and how many people will join. Also, I will be communicating directly (off the blog) with challengers with more information about how will move forward as a group. Are you excited?! I am!! Let’s do this! I’m looking forward to getting to know you better and participating in this Challenge with you! After the garbanzo beans have soaked overnight, drain and place in a pot over medium heat and add baking soda. Cook for 2-3 minutes, then add water and bring to a boil. Simmer and cook until beans are very tender, about 30 minutes. Skim off any foam that comes to the surface while cooking. Drain the beans. Reserve about 1/4 cup of cooking liquid and some beans for garnish. Process the beans, tahini, lemon juice, garlic, 1 teaspoon salt and cumin, if using, in a food processor or high speed blender, like a Vitamix, until they become a thick paste. With the machine still running, add the reserved water and olive oil. Process until very smooth and creamy, about 1-2 minutes. Taste and adjust seasoning and texture to your liking. 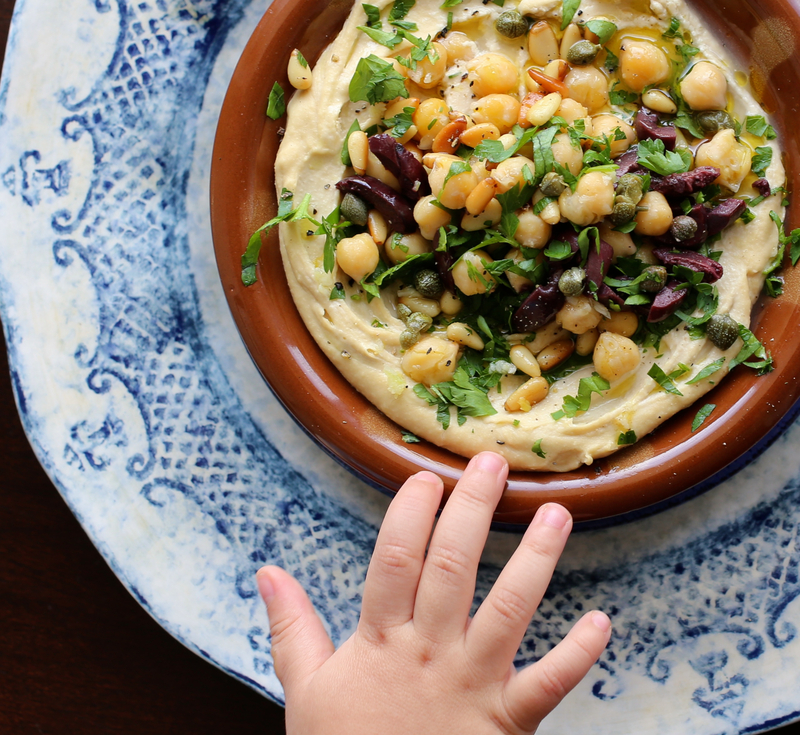 Place hummus in a bowl(s). Garnish as you like with suggested options. Serve with pita bread, if you like. 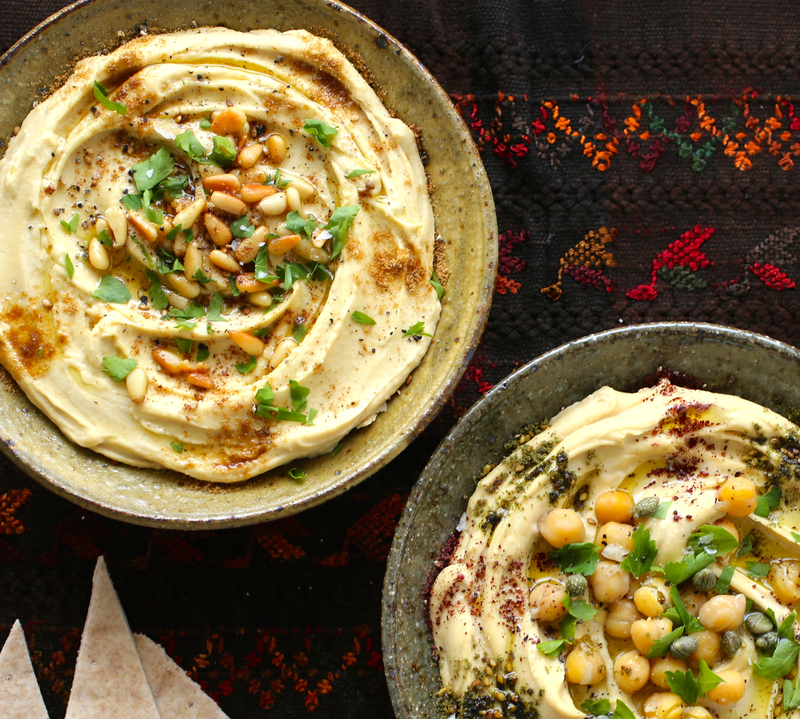 Notes: When making hummus, there are so many ways you can adjust the flavor so you really have to make it a few times to know your preference. For example, some people like it with more tahini, lemon juice or garlic. Even I increase or decrease the amount of some of the ingredients each time I make it. This recipe is more or less a starting point and you can “doctor” it up with more or less tahini, lemon juice, garlic or salt. To garnish, drizzle with olive oil, spices and herbs, or serve alone. The recipe above provides the option of adding 1/2 teaspoon of cumin while processing the hummus or you can sprinkle it after as a garnish. 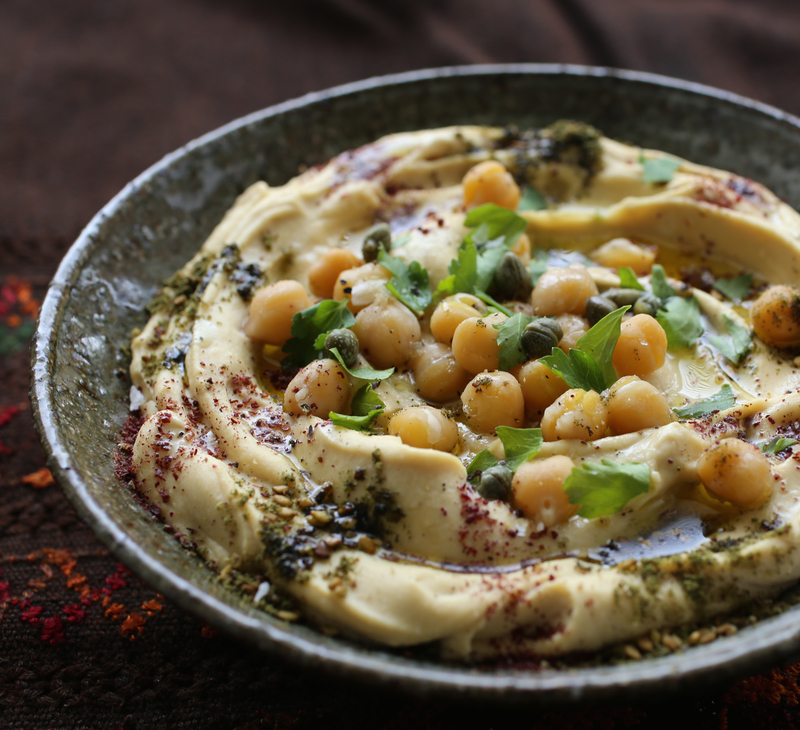 Either way, hummus is a yummy and healthy starter, side dish or snack! This is a wonderful idea! I am definitely interested in joining. Also, your pictures look so tasty I had a hard time reading because I wanted to dip pita bread in my screen. Hi Bekah! Thank you, so glad you liked the photos and so happy you’ll be joining the Challenge!! Please send me your email address (here in the comment section or by email: petitworldcitizen@gmail.com). I’m so excited you’re joining!!! With New Year’s resolutions quickly becoming as stale and forgotten as the Thanksgiving stuffing I found in the back of my freezer the other day, I am very excited about this challenge I came across. The hummus looks to die for as well. Hi Minerva!! So happy you’ll be joining too!! So happy you’ll be joining!!! I’ll be in touch soon!! I’m not 100% ready for this challenge but I’m going for it. Awesome Olane! So happy you’re joining! You’re willingness to go for it makes you ready! 😉 I’ll be in touch by email! Hi Linda! Great! Please send me your email address so I can send you more information and the link to the spreadsheet score tracker! Coucou Martine, je ne suis loin d’être au top pour viser 100 points par jour (surtout les 40 des repas) mais tu peux me compter dans l’equipe ! So glad you’ve joined our team Stephanie!!! Let the Challenge begin!!!! Hi Matina, Only got your bog info yesterday.- see seperate email. It looks great and I see I am too late for the healthy challenge but I am going to try and do it myself and maybe get my daughter hooked in as well, though am not sure how she would fit in the toilet breaks with her job! Hi Veronica! You’re not too late!!!! I’ll respond to your email! The single most important intervention to prevent acid reflux is to eliminate late eating, which in the United States is often combined with portions of large, over-processed, fatty food. Europeans have fewer cases of reflux than we do, even though many of them eat late. That’s most likely from portion control. In France, for example, a serving of ice cream is typically a single modest scoop, while in America, it’s often three gargantuan scoops.